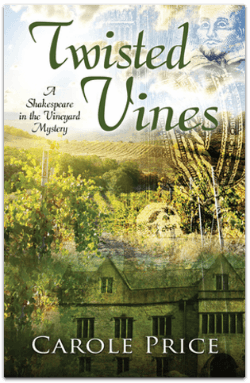 Crime Analyst Caitlyn Tilson Pepper inherits a vineyard and two Shakespearean theaters in a northern California town from a mysterious aunt and becomes a target for murder. Cait’s investigation into the life and death of her aunt Tasha forces her down a road paved with familial lies, devastating secrets, and multiple murders. Marcus Singer, a convicted felon and Tasha’s secretary, and Rachel Cross, a neighbor and Shakespearean actress, resent Cait’s inheritance, but she has the support of Royal Tanner, a Navy SEAL. After two arson attempts at the Elizabethan Theater, a blast of birdshot intended for Cait, and the emergence of questions surrounding Tasha’s autopsy, Cait decides to stay in California — even if it means sacrificing her job and endangering her life.